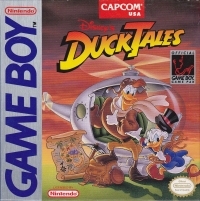 Box Text: Scrooge McDuck takes a world tour on Game Boy! The world's richest, and squawkiest duck hunts a lost fortune around the world and out of it. It's no game for waddlers. There are vines to climb, mines to search, and a haunted castle to conquer! Uncle Scrooge grabs the jewels, then tussles with the spookiest, truest, spider-iest cores to get the big treasures! And there's not much time! - Five action-packed mazes with secret rooms and tricky pitfalls. - Transporters, a helicopter, and a UFO zip Uncle Scrooge around the world! 07-17-2017 pzeke Box Text Scrooge McDuck takes a world tour on Game Boy! The world's richest, and squawkiest duck hunts a lost fortune around the world and out of it. It's no game for waddlers. There are vines to climb, mines to search, and a haunted castle to conquer! Uncle Scrooge grabs the jewels, then tussles with the spookiest, truest, spider-iest cores to get the big treasures! And there's not much time! - Five action-packed mazes with secret rooms and tricky pitfalls. - Transporters, a helicopter, and a UFO zip Uncle Scrooge around the world! For one player only. 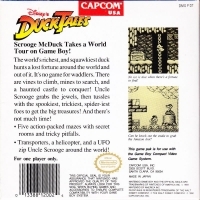 06-27-2016 aliensstudios Box Text Scrooge McDuck takes a world tour on Game Boy! The world's richest, and squawkiest duck hunts a lost fortune around the world and out of it. It's no game for waddlers. There are vines to climb, mines to search, and a haunted castle to conquer! Uncle Scrooge grabs the jewels, then tussles with the spookiest, truest, spider-iest cores to get the big treasures! And there's not much time! -Five action-packed mazes with secret rooms and tricky pitfalls. -Transporters, a helicopter, and a UFO zip Uncle Scrooge around the world! 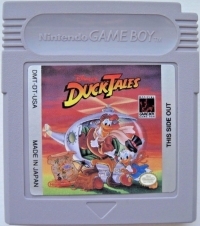 This is a list of VGCollect users who have Disney's DuckTales (Capcom) in their Collection. This is a list of VGCollect users who have Disney's DuckTales (Capcom) in their Sell List. This is a list of VGCollect users who have Disney's DuckTales (Capcom) in their Wish List.